Als ich sah, dass es ein neues Freebook von #madeformotti gibt, habe ich mich endlich getraut, die schönen Federn anzuschneiden. Da man als Mutti ja irgendwie immer ein Taschentuch zur Hand haben muss, habe allerdings noch Taschen an der Seite eingenäht. Ich gehe im Sommer so ungern mit Jacken raus und nicht alle meiner Hosen/ Röcke haben welche...also wird das sicher sehr praktisch sein! 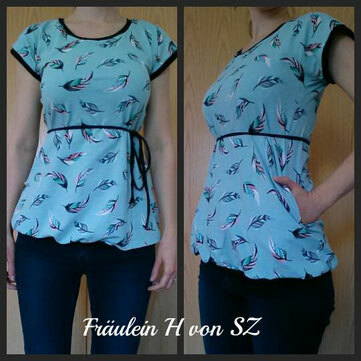 Ein echt tolles Freebook und sicher nicht mein letztes Mutti Shirt! When I saw that #madeformotti has published a new Freebook , I finally decided to cut my beautiful feather fabric. The "Mutti-Shirt" is a very easy pattern which only consists of two pieces: front and back! Since as a mother I always have to have some tissue to wipe noses and hands ,I decided to add pockets in the side seam. I think this will come in very Handy as not all of my Pants and skirts have some. Also, I used a simple "Jersey noodle" as belt: You can tie it wherever you want and wear the bow on the side or back or front. Or you just leave the belt and wear the Shirt a Little loosely fitted. I like the many variants this Basic Shirt offers! Thank you for the freebook and there will definetely be more of these in my wardrobe!